How we begin our days usually takes center stage in planning. We have to wake up, prepare–both mentally and physically–and get into the groove of things. It’s been ingrained into us that breakfast is the most important meal, that we must make sure to take a couple deep breaths, and even do some visualization exercises before leaving the house. Yet, could it be that how we end our days is just as important as how we start them? Turns out, that might just be the case. Although there’s great value in getting up on the right side of the bed, there’s also just as much merit in ensuring we take our time before hitting the hay for the night. So, what’s the one thing every single one of us should be doing before letting our bodies rest for another day? Although journaling seems tedious–and, at times a bit rudimentary–it can be an incredibly helpful way to compartmentalize our thoughts without realizing it. When we go through the highs and lows of each event encountered during the course of a day, we don’t simply recount the facts–we offer our commentary as well. What we say about each event–whether we felt frustrated or jealous or exuberant or nervous–ultimately tells us a lot more about ourselves than what we actually did. As easy as it is to forget, we are not what we do. We are, instead, what we make of our actions. Journaling has been proven to be a very therapeutic exercise. It gives us the chance to sort out our opinions and reflections and to learn from what’s past and look forward to what’s next. Psychologists at the University of Texas in Austin have even gone as far as saying that journaling strengthens T-lymphocytes, which play a crucial role in cellular immune response. Scientific evidence has also touched upon the roles the different sides of the brain play in writing things down. The left side of the brain is graced by logic–using your rational and analytical skills to decipher what exactly occurred today. The right side is governed by creativity, instead allowing you to feel and create. When we journal, both sides of our brain are engaged, reaching prime cranial potential right before you nod off for the night. Before you go to bed tonight, pick up a pen and a piece of paper–and just write. How much better you feel when you wake just might startle you. It’s Trivia Time at CAI Press! TRUE or FALSE? National Trivia Day is March 15. FALSE. It was Jan. 4, but we’re still celebrating. Join us by taking the CAI Press trivia quiz! TRUE or FALSE? The Pittsburgh Steelers and Philadelphia Eagles combined for one season to become the Steagles. TRUE. And, if they can come together, so can your residents. Find out how in Volunteers: How Community Associations Thrive. TRUE or FALSE? The U.S. Bureau of Engraving and Printing sells five-pound bags containing $10,000 worth of U.S. currency for $45. TRUE, but the currency is shredded. Piecing it back together is almost as challenging as collecting delinquencies. We have an easier way: read Delinquencies: How Communities Collect Assessments. It isn’t shredded. TRUE or FALSE? The world over, all McDonald’s golden arches are, well, … gold. FALSE. A McDonald’s in Sedona, Ariz., erected turquoise arches to comply with the town’s design review standards. They must have read Design Review: How Community Associations Maintain Peace and Harmony. TRUE or FALSE? Vending machines kill four times more people than sharks do. TRUE. Which means hidden risks lurk everywhere. Learn how to protect against them in Risk Management: How Community Associations Protect Themselves. TRUE or FALSE? In the earliest versions of The Wizard of Oz, Dorothy’s dog Toto was replaced by an unnamed donkey and a pet cow named Imogene. TRUE. And you thought you had pet problems. Dorothy could have used a copy of Pet Policies: How Community Associations Maintain Peace and Harmony. Buy three or more and get 20% off each one. CAI members receive 40 percent off nonmember prices. Join CAI and save! Order online at www.caionline.org/shop for $8 shipping to the 48 contiguous states. Or call CAI toll free at (888) 224-4321 (M–F, 9 a.m.–6 p.m. ET). Orders placed by phone, fax or U.S. mail will be charged regular shipping rates. As I read through our most recent Fed Ex statement, I noticed a link to an article titled “5 Ways to Attract Attention With Business Cards.” I’d like to share the highlights with you to turn your business card into a multipurpose marketing tool that stands out from the pack, expands your network and brings in new customers. Business cards. While less than 3.5″ x 2″ in size, they can pack a punch. Not only do they provide the fundamentals for getting in touch, they also offer a snapshot of you and your company’s brand. Best of all, they’re easy and affordable to create — a critical combination, if your marketing budget is limited. Elevator pitch. Include a well-crafted elevator pitch that quickly and creatively summarizes your company’s offerings. New acquaintances will walk away with more than just your name and email address. It’ll up your chances of getting that promised follow-up call. Personal highlights. Stand out in a crowd of job applicants with a brief sample of your portfolio or resume. You’ll get noticed when you include a few bullet points about your talents. Referrals. 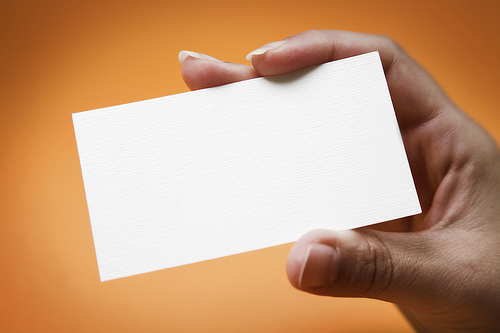 Turn a business card into a referral card. Provide space for your current customers to write their name. Then ask them to refer a friend by giving them the card. When the new customer comes to you with the card, you know whom to thank for the referral with a reward or special perk. Survey. Create a short survey to get customer feedback. With a few simple questions, you can get great insight into how your customers view your business. Use the info to keep your business strong. Offer customers a discount for submitting the completed survey card and everyone wins. Industry tips. Tout your expertise by including industry-related tips. If you’re a massage therapist, offer breathing techniques for stress relief. Operate a dog training business? Give brief dog obedience advice. IT consultant? Advise clients how to prevent or recover lost files. Build customer loyalty by turning a business card into a frequent-visitor punch card. Add a tip chart to help people calculate the gratuity of a restaurant bill. They’ll have a reason to keep the card in their wallet, and they’ll see your name and brand every time they use it. Make your card do double duty as an appointment reminder. A handy way to help ensure your client shows up while reinforcing your brand message. Remember to include the CMCA credential behind your name on your business cards! Need something to light a fire under you in the New Year? Here’s your match. Productivity is a hot topic at Fast Company, and one that our contributors and the CEO types we cover spend time thinking about (efficiently, before crossing it off a list, of course). Ekaterina Walter is a global social innovation strategist at Intel, so if anyone has an excuse to glut on social media, it’s her. But even social media pros have to set parameters to avoid being sucked in. Kaihan Krippendorff, author of Outthink the Competition, uses a lesson from his days in food service to keep his days flowing smoothly. This way, he says, every motion counts….twice. This year, he put that habit to work in his daily routines. Dayna Steele has one word for a more productive year: Dropbox. “No matter where I am, I can send a client, potential client, speaker agent, meeting planner–anyone–a file they need to keep my business moving forward,” says Steele. “Adopting a dog from the Buffalo City Animal Shelter was actually the most productive thing I did in 2012,” says Kevin Purdy, Fast Company contributor and former contributing editor at Lifehacker. Going to the company office holiday party this year? You can take advantage of the office party to have some fun and advance your career or misbehave and cripple your career. Here are some basic rules and guidelines — key do’s and don’ts — to surviving and thriving the holiday office party… or at any company-sponsored party. Don’t pass up the invitation to an office party; not attending could hurt your reputation. And when you attend, do spend at least 30 minutes at the party for appearances. But don’t overstay your welcome by partying until the wee hours. Do conduct yourself professionally at all times. Don’t use the office party as an excuse to blow off steam. It’s still a company function, so proper etiquette and decorum matter. Don’t bring the party lampshade, gag gifts for the boss, or any other crazy stuff you might do at a personal holiday party. Don’t pull the nightclub attire from your closet for the event — and do ask whether the attire for the party is formal or casual. The party is still a business function, so conservative party clothes are a good choice. So, do remember to skip anything too revealing or too flashy. Keep your reputation for good taste intact. Do keep your hands to yourself. Don’t flirt, and do avoid any other inappropriate behavior. The office party is not the time to end your career with the company by doing something inappropriate or illegal. Don’t spend all evening talking business. You’ll forever have the label as the office bore. Do keep all conversations positive and upbeat. Don’t spend the evening complaining, bragging, correcting, whining, or ridiculing. And do avoid controversial subjects (such as religion, politics, etc.) and off-color jokes. Don’t monopolize conversations — and, especially, don’t talk about yourself or your accomplishments all night. Do show interest in others. Do be gracious and thank coworkers and team members for all their help and hard work during the past year. And don’t even think about gossiping about others. Don’t feel you need to drink excessively just because it’s an open bar. And don’t pig-out at the food buffet either. Moderation is key. You can always eat and drink more after the party. Do be sure you know exactly who is invited to the party. Spouses or significant others are not always on the guest list for office parties. And if guests are permitted, don’t bring an inappropriate person as your guest. Don’t forget to thank the person responsible for the planning and coordinating of the party. And do consider sending a thank-you note to top management for hosting the party. Do inquire about office policies on providing car or cab service for employees attending the holiday party. And do appoint a designated driver or do hire a cab yourself if the company is not willing to provide the rides home. Dr. Randall S. Hansen is founder of Quintessential Careers, one of the oldest and most comprehensive career development sites on the Web, as well CEO of EmpoweringSites.com.